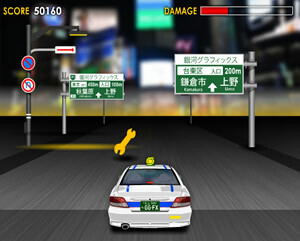 Tokyo Taxi - a brandable game by Galaxy Graphics. Flash Games licensing. A very simple driving/avoiding game. Use left and right dodge the taxi to avoid hitting the cones (causing damage) and pick up the gold spanners (fixing damage). Can easily be themed for any place / city/ object you want to avoid / collect. Looking for the Toyko Taxi source code in actionscript? The source code for this game is also available to buy from Galaxy Graphics. Click here to contact us about source code.